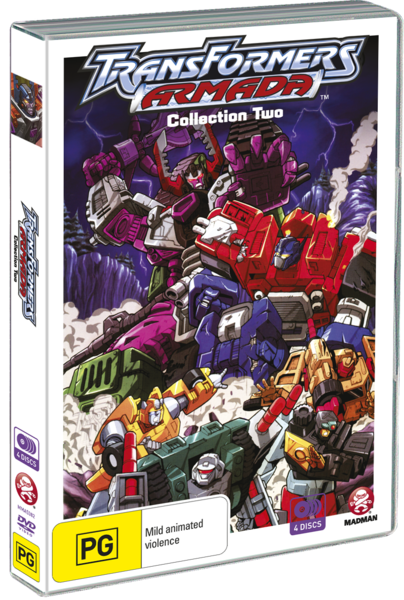 Transformers Armada Collection Two is the second (and final) half of this animated sci-fi series. The war between the Autobots and Decepticons for the Mini-Cons still wages strong. Both factions have secured quite a few Mini-cons including some that have the ability to join up to create great weapons such as the Star Saber and Skyboom Shield. There is also word going around that there is a third group of Mini-Cons that combine to make an ultra-powerful gun that shoots laser beams called the Requiem Blaster. 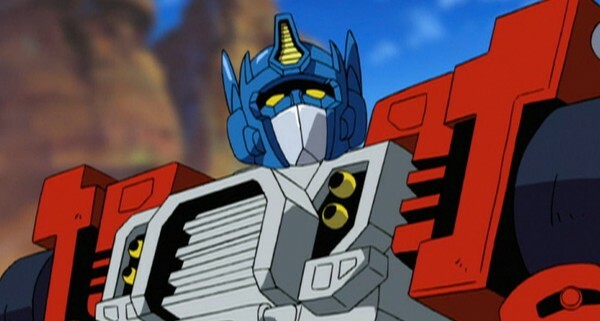 The Autobots are in a very desperate state and must get a hold of them before the Decepticons do as not only does the Decpticons have the Star Saber but they have also got more recruits that came all the way from Cybertron to help them destroy the Autobots and conquer the Universe. 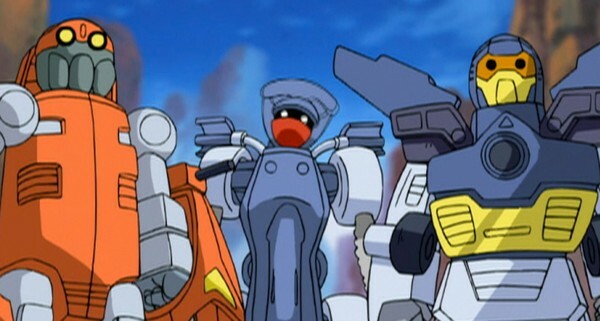 Little do the Autobots and Decepticons know that there is a third party involved in this war as a rouge transformer named "Side-Ways" has made a secret pact with "Thrust" of the Decepticons whom both plan to help Megatron obtain the three great weapons and then swipe them from right under his nose. Side-Ways is also using Thrust as a pawn as Side-Ways' true plan is something that won't only doom all Transformers and Humans but it will threaten the whole Universe as we know it. What could it be? I'm too afraid to find out (not really as I'm just using this line for a cheap hook-in to get you to read the review). Trouble or not this is going to be one heck of a show. (Click "Read More" to read the full review). The story in this version of Transformers is none like you would see in any other Transformers series as it is a very progressive series. I like how this show has an on-going story line that progresses with each episode and you will also be drawn in to how exciting and intense the story is and it'll keep you on the edge of your seat until the very end. This is also a fairly easy show to watch where you can multi-task and keep up with the show at the same time. Action in this show is very cool, exciting, and a bit more violent than the other Transformers series as you will actually see the transformers receive battle damage from direct hits with projectiles and melee weapons and they also lose parts during battle (like wings and guns). It's not too overly violent to where it will be inappropriate for kids to watch but it is nice to them do more with the action rather than have them shooting at each other and missing their targets. I really enjoyed the characters in this as the Autobots were very heroic and cool. Decepticons in this show are very menacing and feel like how bad guys should be in these kinds of shows. I really liked what they done with Starscream's character in this show as it is quite different but worked really well where it still felt like Starscream. The human characters and Mini-cons have matured a bit since the first collection and I like that as they are less annoying (not like they were overly annoying to begin with) and more helpful to the Autobots and you will find yourselves really enjoying them. I don't think they could re-make this version of the transformers as this show was created at the right time and period of animation (although I guess they sort of did that with "Transformers: Prime (2010 - 2013)"). 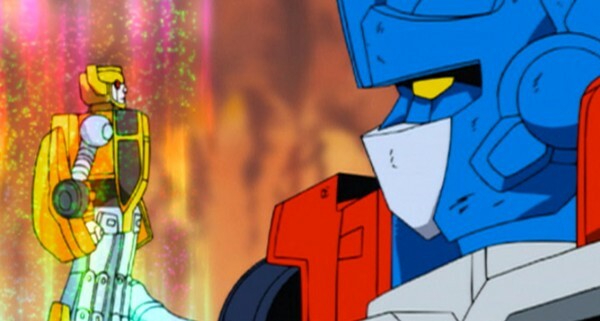 Artwork of this show is fairly basic (by today's standards) but that doesn't mean that it looks bad as it actually looked pretty good and the anime art style really suited the Transformers very well. There are some problems with the art but there really isn't that much as the mistakes you'll see are some mis-coloring of some parts on the Transformers (example: the Autobots logo was purple for a few seconds) and there was one moment where the main human characters had their faces swapped with each other for one shot and it looked very painful to look at. Character designs are very cool and look like how Transformers should look like plus it also has a hint of inspiration from the Gundam franchise. I do also like how they made some of the characters by mixing up past renditions of them into one new design and yes that does sound like very lazy designing but it worked really well in this case. 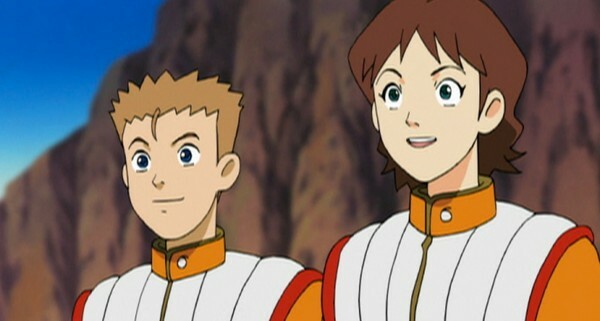 One thing that I did find lazy is that mid-way into the show we see some characters getting upgraded and instead of giving them all new designs they instead just recolor their skin although I did find the color change to look really cool but it would've been nice to give them new designs to go with them. It was probably a bit unfair of me to call the artwork completely basic as there are some nicely detailed shots like when they do close ups of the Decepticons faces and you can see the back of their eyes through their eyeballs and it looks very terrifying making the Decepticons look more menacing and evil. Animation in this show is a bit mixed in quality as in some episodes it can look really good but in other episodes it can look a little flat with animation that looks like something you would see out of a digital comic book. The English dub is decent with voices that really suit the characters but the problem that I have with the dub is with the writing and that you will hear some inconsistency with the dialogue and it sounds very corny. One example is with the character "Wheeljack" and in one scene he says "I'm not interested in revenge" and only a few seconds later he goes "Now it's time to take my revenge". It was very nostalgic for me listening to the soundtrack as it has a very early-two-thousands techno sound and while it doesn't sound bad it also hasn't aged too well but it could've been worse. A very micro but very sweet special features section as we get some very awesome photos of the toyline that the show is based on with some very nice profiles included. The toys that you will see in this release are of all the Micro-cons that form into weapons and pictures of Unicron and some miscellanies figures. All the photos are taken from (almost) every angle you'd like to see them and you also get to see photos of them in all their forms (like transformed mode, vehicle mode, ETC.) and I just love it and I must admit that I want to track down some of these old figures for myself. Overall this was a very good version of Transformers and I defiantly recommend checking this series out. Very solid viewing. Animation Studio: Actas Inc, Aeon Inc.